The American artist Frank Stella, 81, best known for his Minimalist and abstract styles, will tell you that, without travel, he wouldn’t have been able to sustain his career as long as he has. “Seeing great art in different destinations gives me the motivation to keep going and holds me to a high standard professionally,” he said. 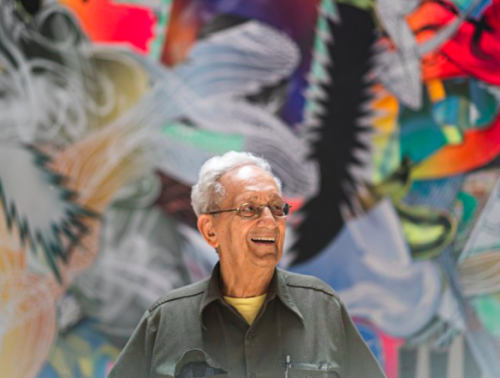 Now, Mr. Stella’s 60-year trajectory as an artist, which developed as he traveled the world, is on display in an exhibition, Frank Stella: Experiment and Change, at the NSU Art Museum Fort Lauderdale, in Florida; the show will run from Nov. 12 to July 8, 2018, and includes approximately 300 of his paintings, sculptures and drawings spanning from the late 1950s to the present. Mr. Stella lives in New York City and spends between 30 and 40 percent of his time on the road for work, traveling to his exhibitions and giving talks on his art. Below are edited excerpts from a recent conversation with him. How did an exhibition of your works end up in Fort Lauderdale? What is the city’s art scene like? When I think about art in Fort Lauderdale, I also include Miami because they are so near each other, and together, they are a lot more visible now in the arts world than they were several years ago. The excitement around Art Basel, the show in Miami Beach, is an example of this visibility, but some of the museums are also high-caliber. The NSU Museum, for one, is in an interesting modernist building designed by the American architect Edward Larrabee Barnes. I had visited the museum before and admired many of the works inside. I had also worked with the exhibit’s curator, Bonnie Clearwater, in the early 2000s on an exhibition of my art at the Museum of Contemporary Art, North Miami, and when she approached me about this show, it was a no-brainer for me to say yes because of my relationship with her and my fondness for the museum.